Facebook Check In - How to use Facebook check in to get new customers. Facebook executives announced the launch of Facebook Places back in 2010, which similar to services such as Foursquare and Gowalla -- will allow people to use the GPS on their mobile phones to let friends know exactly where they are. Users who wish to announce their location to their friends on Facebook would tap a "check in" button to see a list of places nearby, and then choose the place that matches where they are. 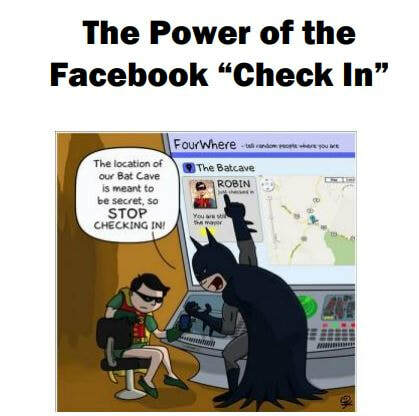 "After checking in, your check-in will create a story in your friends' News Feeds [on Facebook] and show up in the Recent Activity section on the page for that place". Places product manager Michael Sharon wrote on Facebook's blog. Facebook staff also said the feature will be useful not only to let friends know where they are, but also to learn if their friends are nearby at the same time, and to write down what they are doing at the location and what they think about it -- creating a trail allowing friends to see what the writer did there days or even years ago. When users check into a place, they also can "tag" any Facebook friends who are with them, essentially letting other friends know that the person is there, too. To cut down on the potential for users to falsely tag friends to a place, people can tag friends only if the taggers themselves check in to the location, too. ​The past year has seen big growth in the relatively new mobile check-in space. On mobile apps like Foursquare, users "check in" at restaurants, bars, movie theaters or just about anywhere else they visit. The idea is twofold -- to let friends know what you're up to, while racking up points and earning virtual badges in the application's gaming element. The New York-based Foursquare has begun forging some corporate partnerships and some businesses have started offering discounts and other deals for users who check in frequently. Facebook, with its two-billion users, represents a massive potential user base for Places. When a customer checks in on FourSquare or Facebook FB +0.46%, the business’s name is displayed for that customer’s friends and followers to see. There’s no denying the exposure is great for business. The big question is, how do businesses get customers to check in? If you own a retail storefront, chances are most of your customers are armed with smartphones. For those customers, checking in is as simple as a couple of taps on the screen. In some cases, encouraging a check-in is as easy as reminding them about it. But for other customers, you may have to provide an incentive. Here are a few ways you can increase the odds that your customers will take that small extra effort to check in at your location. Post occasional reminders on your social media sites encouraging customers to check in when they visit. Your social media outlets are the best place to direct people to check in, since you’re likely speaking to those who are avid social media users. However, there may be an element of “preaching to the choir” with Facebook reminders, preventing you from reaching out to those who might not already be following you. Another great place to encourage check-ins is your own website. If you’re offering an incentive for checking in, this is a great place to mention that, as well. If you maintain a blog on your website or take out an advertisement or coupon in a local publication, add a short message encouraging customers to check in. As mentioned above, for some customers all you need to do is remind them to check in. FourSquare provides stickers and window clings that you can post on cash registers and entry doors to get the message across to your customers. However, this generic signage doesn’t include a business’s username. A small investment in custom social media check-in signage could pay off if it increases the number of daily check-ins. Customers who check in should be provided exclusive access to specials. If those who check in at your location become VIPs who receive discounts and deals, more of your customers will want to check in. As a bonus, some of your customers may let their friends know about the special discount by sharing your messages across their social media sites, which will encourage more customers to check in. Consider having a social media night, where you open your doors only to those customers who have checked in for an evening of discounts and stress-free shopping. Provide refreshments and decorate your store as you would for any party to make your guests feel as though they are VIPs. Nothing is more effective than an old-fashioned bribe. Offer a gift or ten percent off for those who demonstrate at the register that they’ve checked in. Some businesses might choose to be straightforward about the gift customers will receive at check-in, while others may decide to promise that customers who check in will unlock a surprise gift. How to enable Check In on a Facebook business page? Easy - Go to your Facebook business page on your desktop computer, click on the "About", section. On the right side of "About", click on "Edit Page Info". A new window opens, at the top click on "Location". You will now see a map, with the business address and underneath the map there is a check box and "Customers visit my business at my street address (unchecking this box will hide your street address and check-ins)". Click inside the box if it is empty, and now click on "Save Changes". Get your customized check - in sign made by us! We have over 100 designs to choose from. Other companies are charging $499.00 for a customized Check In sign! For more than one Check - In sign, there are further discounts available. Why more than one? We can create different offers, for different occasions during the course of the year. ​Contact us today for your Check - In sign and we will get it ready for you within the next few days.